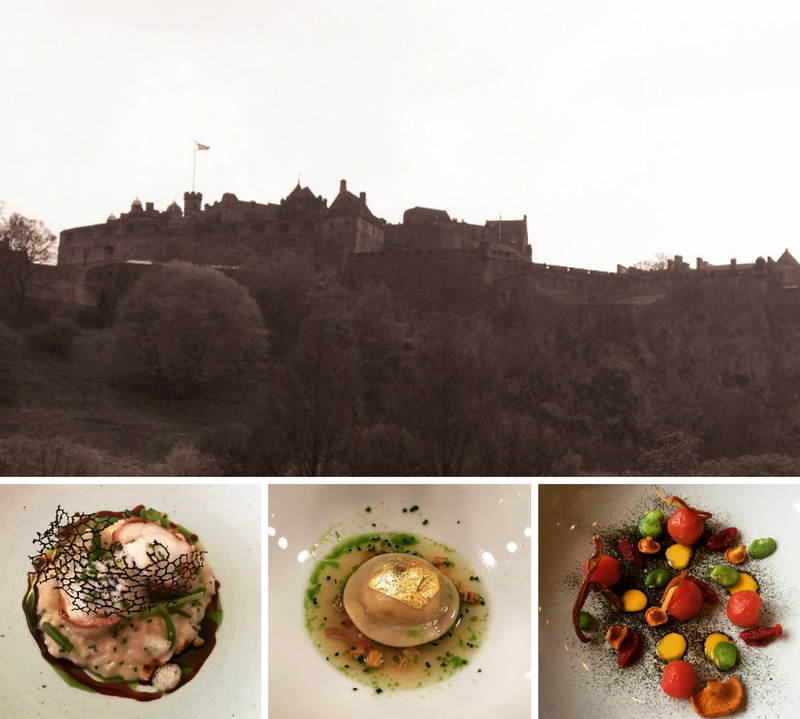 Out at North Queensferry, this is stretching the limits of Edinburgh Feasts a little, but photos of the launch of this place had me intrigued – plus, I got to go over the new Queensferry Crossing. I don’t drive but I had a willing accomplice who would take us. However, you can get a train to North Queensferry and then have a 15 min or so stroll to the restaurant should you want a tipple with your meal. The Shore forms part of the Doubletree by Hilton hotel and comes from the people behind Twenty Princes Street and Juniper in the city. Upon arrival it was clear that this was a beautiful location. The view both from the car park and the restaurant was gorgeous. The Queensferry Crossing stretched out before us and you could see boats drifting up and down the Forth. The restaurant clearly takes advantage of this with floor to ceiling windows across a full side of the restaurant. A lovely start for a Sunday lunch. The Sunday lunch menu has lots of choice, with several different roasts to pick from. There were even two veggie options as well as a sharing lamb platter or, if you didn’t want a roast (odd), options such as steak or fish and chips. There are some great sides such as mac and cheese and you can even get additional Yorkshire puddings (although as it transpires, you might not need to). We were perhaps a little over ambitious and ordered starters as well as a roast. I opted for the chicken liver pate followed by the roast beef and my dining companion chose the salmon to start followed by the roast chicken. The starters looked great. My pate came on a wooden board with a rack of toasted brioche, butter, chutney and rocket. The toast to pate ratio was spot on. The brioche was a really lovely choice and I adored the plum and apple chutney. I probably wouldn’t have chosen to have salt flakes on my pate but that is personal preference and was easily rectified. A really delicious dish. My friend’s salmon was beautifully presented. This Scottish salmon was cured with lemon and yuzu and came with a wasabi emulsion, pickled veg, avocado cream and a fish skin cracker. She loved this plate of food and I have to say I was quite envious of it too. She said it was light and fresh, with the salmon still the star of the dish. The roasts them followed and wow, that was a big plate of food! Pretty much all my food was obscured by the humongous Yorkshire pudding balanced on top. Peeking underneath I could see some thick slices of beef with carrots, parsnips, roast potatoes, cabbage and a glistening gravy, as well as a horseradish and grain mustard sauce on the side. I really don’t know where to start with this as it was all really tasty. The meat was succulent and generous. The red cabbage was spectacular and the Yorkshire pudding was stellar. My friend had pretty much the same but sage and onion stuffing instead of the horseradish sauce. She has also got to choose whether she wanted drumstick or thigh along with her breast meat, which was nice to be offered the choice. She loved it as much as me but we did had to admit defeat and couldn’t quite finish it all. We couldn’t managed dessert as we had over egged it with having the starters. Next time we would have roast and then see if there was room for dessert afterwards. We did really enjoy our time at The Shore though, with the views and food working together to make a great experience. It’s worth travelling outside the city limits for. Scot Rail and Rabbies have joined forces for a number of tours which involve the recently opened Borders railway. I should say from the start that these tours are still in their pilot phase and we were invited to see what it was all about and opted, naturally, for one of the food and drink tours. Our journey started at Edinburgh Waverley as we boarded the train. At this time of day (1.30) it’s not busy so doesn’t inconvenience those dealing with the hectic commute at the beginning and end of the day. Although not overly scenic to begin with, once we left the Edinburgh suburbs the greenery flanked either side of the train tracks, winding rivers, castle towers and wildlife – we even spotted deer. We were fully relaxed by the time we arrived in Galashiels. An easy hop across the road to the bus interchange and we were met by our Rabbie’s tour guide Audrey. We were the only two on the tour that day but that allowed for an informal feel to the proceedings which was right up our street. As we headed to our first foodie destination, Born in the Borders, our guide regaled us with the history of the area, which was really very interesting. Upon arrival we were hungry and just managed to catch the end of lunch service. I got a bowl of bacon and lentil soup and my friend went for a chicken and stuffing sandwich. Whilst we waited for food we admired this beautiful building filled with branches covered in twinkly lights. We had a quick hello from the owner John, who had his hands full working on the microbrewery which is situated on site. When the food arrived, I was amazed at how generous a size my soup was. The bowl was the size of my head! It was very tasty with plenty of bacon through it. On the other side of the table, the sandwich was being thoroughly enjoyed. We were both pleasantly surprised at the level of this food. The food plus a couple of soft drinks came to just over £14. We then had a mooch around the rest of the site, getting some cute Salt Pig salt in the deli. The microbrewery seems to be popular and we got to sample some beers (not my thing but my friend particularly enjoyed one called “Foxy Blonde”). I liked a raspberry vodka that they have for those less beer inclined. There were also riverside walks and a small play area on site for children. However, time waits for no-one and after an hour here we set off to our next destination. We then stopped off at Teviot Smokery and Water Gardens before we went to Jedburgh. This place had a lovely range of smoked goods as well as gifts, plants and a cafe. I bought some smoked cheese, my friend got some crackers and even the tour guide got some smoked chicken. We had a nice chat with the owner who told us lots about the smoking and how they source their fish. They also sell their produce online, which is good to know as you might not want to have smoked fish on the tour bus for the rest of the day! Then off to Jedburgh. This is where we started to realise that the tour needed to have its times tweaked. We didn’t stay as long here as planned as we arrived after most of the town had closed for the day. Whilst we still got to see the outside of the abbey (which was impressive), the Mary Queen of Scots house and the high street, we couldn’t really make the most of the place as we couldn’t go inside anywhere and we weren’t ready for more food at this point. There did appear to be a cute little chocolate shop but it was closed so we couldn’t get anything there either. So we went onward to Kelso. A pretty little market town, with another abbey ruin. We were recommended to try the Cobbles for dinner. After a quick look at the menu we were sold and popped in. We luckily got the last table available in the restaurant area. We’d only eaten about 3 hours earlier so we ended up choosing lighter options but there was a great choice with 3 different menus; a bar menu, a restaurant menu and because of the time we were there, an early supper menu. We were told by the helpful waiter we could mix and match. I went for the goats cheese and beetroot salad and my friend went for mussels. I was really happy to see such a pretty salad arriving. I was also pleased to see the goats cheese not one lump in the centre of the plate. Little discs of cheese had been grilled. Nasturtiums decorated the plate with a vivid purple colour, almost putting the beetroot to shame. Candied walnuts and sesame seeds were scattered through to add texture as well as more flavour. A very delightful plate of food. The mussels were also enjoyed and the bacon, cream and garlic sauce was great and the garlic had great punch. The accompanying bread with the meal probably isn’t worthwhile though. These plus a glass of wine and Diet Coke came to just over £30. Back out and to the train station after having a fun outing. The Borders has plenty to offer and with a bit of tweaking, this tour could really be worthwhile for exploring. Cost £35 for the tour and train travel per person (comped). Food costs are listed in the body of blog were paid by ourselves. Please note that whilst part of this trip was complimentary, views expressed are my own. Thank you to Ashley from Wire Media for arranging.